This compact powered foldback speaker puts your vocal sound right where you need it! Similar in concept to Mackie’s SRM150, and with the same nominal power rating, the LiveSys5 is vaunted as a micro PA and monitor system. While it could be argued that it is more of a personal monitor than it is a PA system, it could perform as a useful extension to an acoustic guitar/vocal combo to help spread the sound, or to handle the vocals for living-room band rehearsals. The LiveSys5 also includes basic mixing facilities, so can be used with a powered extension speaker to form the basis of a small PA.
With the Union flag proudly displayed on the speaker grille and a discreet ‘Made in China’ stamp on the rear, the speaker’s provenance is clearly ‘Designed in the UK, built in China’, which helps account for its attractive price. The moulded plastic cabinet, which has a handle moulded into the top for ease of carrying, is light in weight and angled back slightly to throw the sound upwards. A metal grille protects the speaker. Power comes in on a standard IEC connector with a rocker power switch alongside. 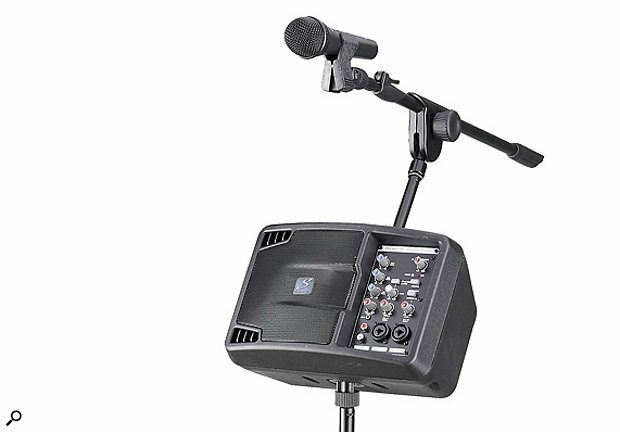 A threaded insert in the top allows for the included short extension arm to hold a microphone above the LiveSys5 so that everything can fit on a single stand. Powered by a 150 Watts (continuously rated) Class-D amplifier and employing a single five-inch driver, this shoe-box-sized powered speaker incorporates a three-channel mixer section comprising a pair of mic/line inputs on balanced TRS/jack ‘combi’ connectors, plus a line input that can be fed in either on a pair of RCA phonos or a 3.5mm stereo mini-jack. Channel one can also be switched to a high-impedance instrument mode. There’s an overall three-band cut/boost EQ (12kHz, 2.5kHz and 100Hz), switchable 48V phantom power for the mic inputs and — something Mackie don’t offer — an onboard delay effect for those who like to hear a bit of extra ‘wet’ in their monitors. The speaker can mount on a mic stand via the included adaptor, which is ideal for personal monitoring or for use as an extension speaker. The mixer panel is safely recessed and all three channels have simple rotary level controls. Above it is the master section with centre-detented rotary controls for the high/mid/low EQ, a phantom power button with status LED, a master volume control and a button above the effect level control that adds the effect either to both mic channels or just to channel two. On the rear panel there’s an XLR/TRS jack input that can be fed from a console’s monitor mix, but if you prefer to plug your mic directly into the LiveSys5 and then send the signal on to the PA or to a second powered speaker, there’s a balanced XLR ‘thru’ output that can be switched between mic and line level to let you do exactly that. The LiveSys5 does exactly as intended and, because the low end rolls off fairly steeply (-10dB at 80Hz), it can be cranked pretty loud, hitting a maximum of 114dB SPL at one metre. The -3dB points are 100Hz to 10kHz, which is to be expected given the lack of a separate tweeter. Nevertheless, this covers the essential vocal range pretty well, though I found the vocal sound just a hint dull with all the EQ set flat. A gentle upward nudge of the treble control redressed the balance but you have to be careful not to add too much top as that can aggravate feedback problems. I tried the LiveSys5 at a pub gig and, though it was easily loud enough, I don’t think I could get quite as much level before feedback as with my Mackie SRM150, once I’d adjusted the EQ for decent clarity. However, it did the job and the LiveSys5 is less than half the price of the Mackie! The choice of ‘effect’ is curious, as it is simply a preset short echo with enough feedback to add decaying repeats; it sounds almost as though you are singing in a very resonant tunnel. If you add a tiny bit it can help ‘wet’ your vocals, but you wouldn’t want it to be up loud enough to be noticeable. Overall, then, the LiveSys5 makes a practical personal monitor or extension PA speaker for solo artists or duos playing in small venues. I use personal monitoring at all my pub gigs so need no convincing about the effectiveness of this type of speaker, and I’d have no hesitation in recommending the LiveSys5 as an affordable solution. I’d leave that effect knob turned well down though! The first personal monitor I saw came from Galaxy Audio, but Mackie’s SRM150 really defined the template for what came after that. Since then personal powered monitors have been built by Wharfedale, TC Electronic, Behringer and others. Delay effect is not that great. An affordable personal monitor that can double as a powered extension speaker.